Cooking and baking are likely to be a regular feature over the next couple of weeks. The kitchen is where I’m spending a reasonable amount of my time. Cooking with beer also gives me an almost good excuse to enjoy a delicious beer. It’s educational! Let’s start with some baking. 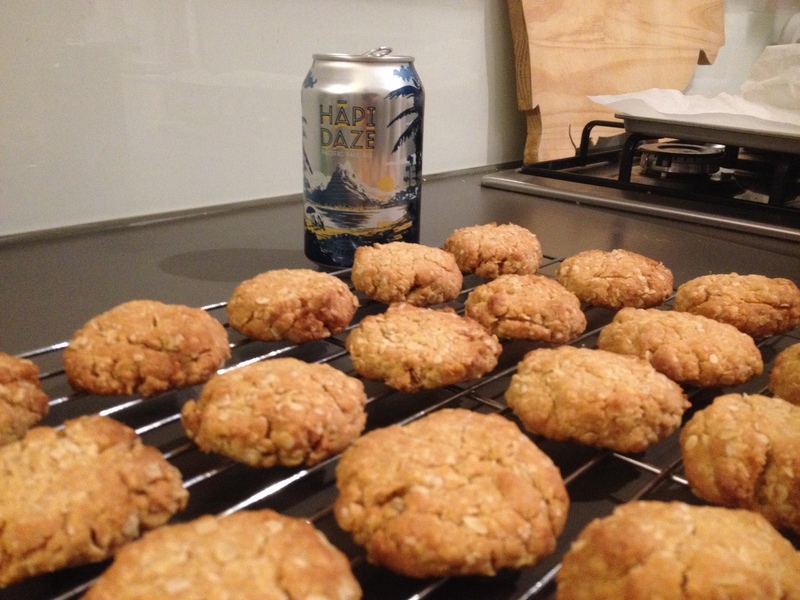 Anzac biscuits are the definitive South Pacific sweet biscuit. If I was as on the ball as I pretend to be, I would have looked into baking these over Anzac Day back in April. Instead, I find myself a couple of months late and not quite relevant. Still, they’re delicious so the timing hardly matters. For the uninitiated, ANZAC refers to the Australia and New Zealand Army Corps. The origin of the biscuit is contested. Did wives of soldiers abroad send them overseas because they did not spoil? The more likely tale is they were baked and sold at fetes and parades to raise money for the war effort. How can you improve a treasured biscuit? By adding beer of course! 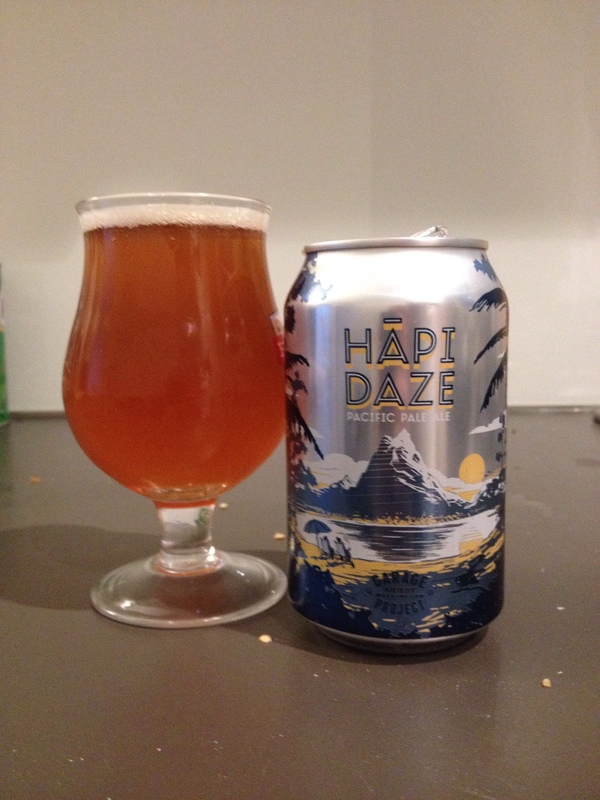 I had a can of Garage Project’s Hāpi Daze in the fridge for such an occasion. Made with all Kiwi ingredients it struck me as the perfect brew for the job. 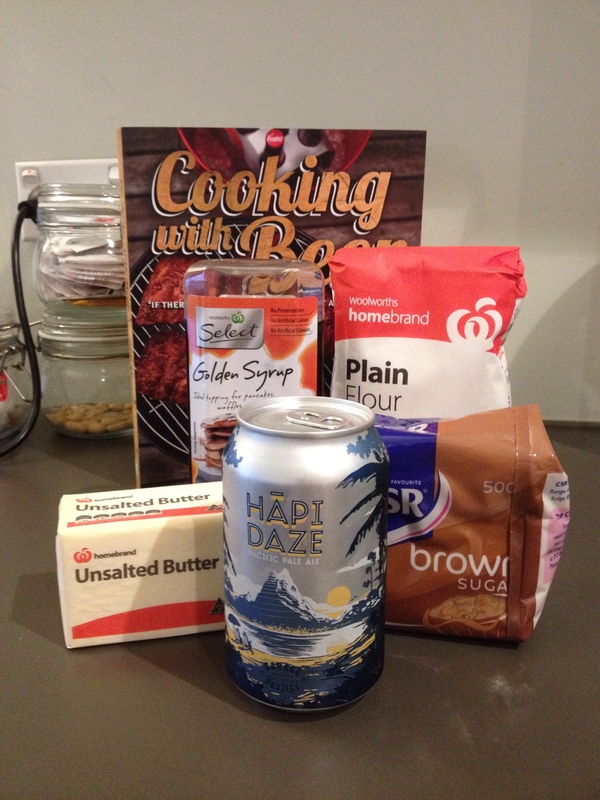 I’d never baked these biscuits before so I wasn’t sure when I’d add beer to the mix. On learning three tablespoons are all that’s required, you can appreciate why I liked this recipe. The effort involved was minimal and the payout was more than worth it. I was delighted with how the Anzac biscuits turned out. I’d made them a little on the thick side which gave the biscuits a cake like centre. The outsides were crisp and golden, perfect for dunking in a cup of tea. I’m not sure the beer brought anything extra to the biscuits. I couldn’t trace any hoppy aromas or flavours. It’s a good job I had one on hand to drink. I know what you’re thinking. This baking thing is all well and good but where’s the beer battered fish and chips? Or the steak and ale pie? These are the foundation dishes of cooking with beer. Both are reliant on the quality of two important features. For one it’s the pastry, for the other it’s the batter. I have good news for you! I’ve attempted beer batter in the past with reasonable success, more on that another time. Next up on my list was the pie. Making the filling was a breeze. It worried me. I must have done something wrong, how could it be this easy? Did I miss a step? I’ve come to terms with the kitchen. We’re no longer enemies. I’m close to getting my zen on when chopping and preparing. 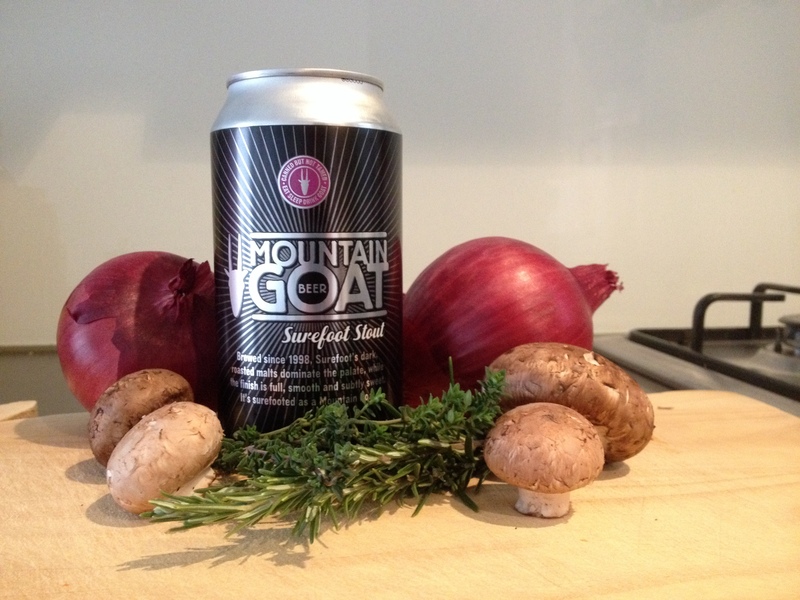 Red onions, herbs, steak, mushrooms, and my last can of Mountain Goat Surefoot Stout (for now). 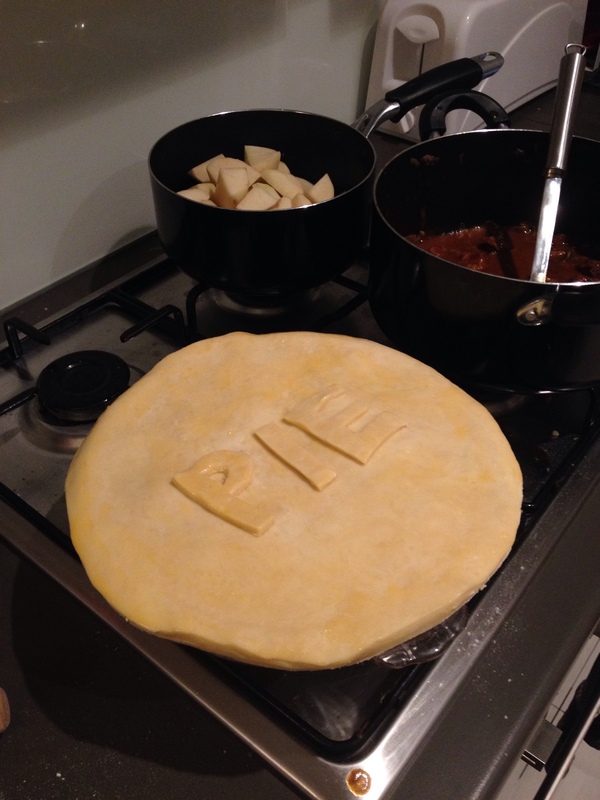 Had I been an organised man, I’d have got some more in to pair with the pie when it was ready for eating. Please, feel free to question my commitment to this hobby. I’d been browsing a solid recipe for a steak and ale pie for some weeks. The most bizarre thing I found during my search was most recipes only topped the pie with pastry. I looked high and low for an example of a pie lined with pastry to no avail. Perhaps this was a technique reserved for the snack pie? Who knows. Still being somewhat of a novice in the kitchen, I decided against winging it. Jamie Oliver provided the base I decided to run with. I was nervous. I’ve had encounters with Jamie’s pastry before. I was close to breaking point rolling out a sweet pastry for an apple pie a few weeks ago. There would be no pie without a crisp, golden buttery topping. Worry, fear and doubt were nowhere to be found. It came together under my hands in next to no time. In to the fridge it went. 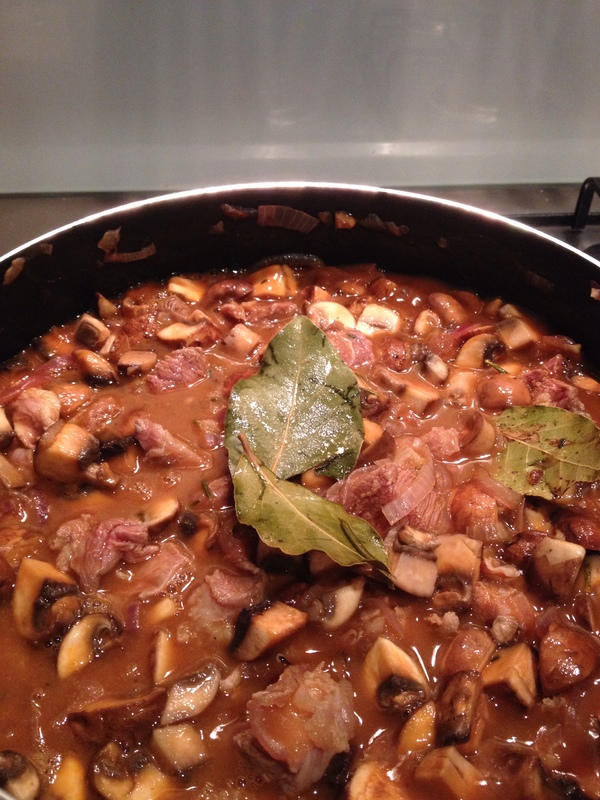 The filling was bubbling away, the meat tenderising, the liquid thickening. There was nothing to do but wait. Our friends Alyssa and Daniel were joining us for dinner. My unsuspecting but willing guinea pigs. Dinner was served. “This is like proper English pub food.” said Daniel. The only higher compliment was when he went for seconds. I’ve had a slice of pie every day for the last three days. There’s still more in the fridge. I guarantee I’ll be making one again. 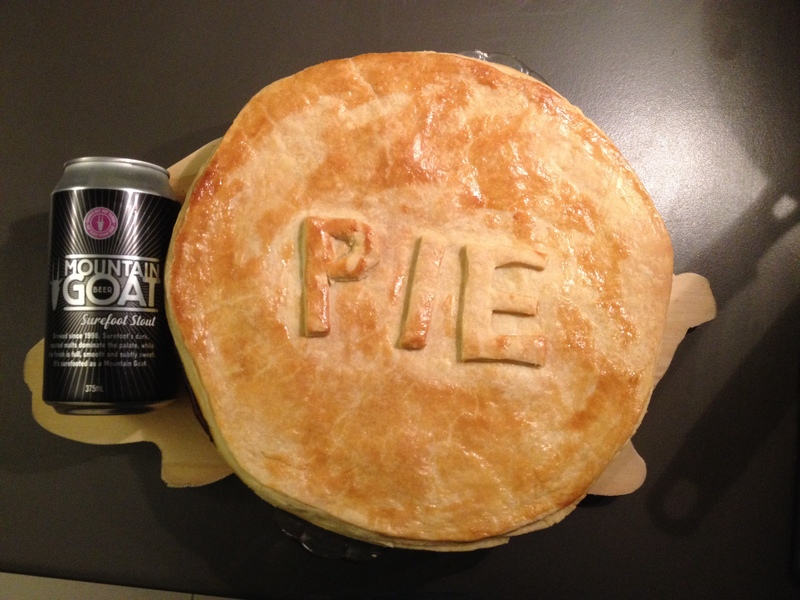 The steak and ale pie concludes stage one of my research into the use of Surefoot Stout in the kitchen. What’s next on the agenda? A beer style I’m not super comfortable with but seems to be popular in food, the saison.